The Stew ‘n’ Drew’s approach to ice cream begins with us going direct to a local farm for our milk. We then pasteurise the milk ourselves, which gives our ice cream its distinctive taste. We make our ice cream in small-batch freezers – another benefit – using the choicest ingredients. The secret stage of our process may or may not involve chanting and the sprinkling of magic ice cream pixie dust. 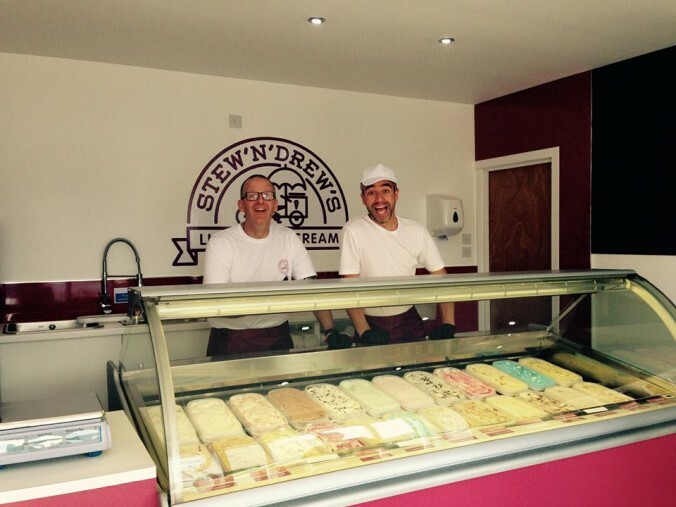 Once made, our ice cream is tried and tested by our pair of in-house experts, who also happen to be called Stew ‘n’ Drew. That’s them pictured above – the wrong way round. As well as Traditional Vanilla, our most popular flavours include Strawberry Arabeschi, Apple Pie, Espresso and Peach & Mango. Beyond this lies our experimental side. We enjoy pushing the boundaries and have created ice cream with cask-strength whisky, BrewDog beer, wasabi and butteries (but not at the same time). Stew ‘n’ Drew’s HQ is in the Moray seaside village of Hopeman where we have our first ice cream shop. Our second ice cream shop is also on the Moray coast in the fishing town of Buckie. You will also find our luxury dairy ice cream at cafes, parlours, delis, restaurants and hotels across Scotland. Fancy giving your customers the taste of Stew ‘n’ Drew’s? Get in touch.